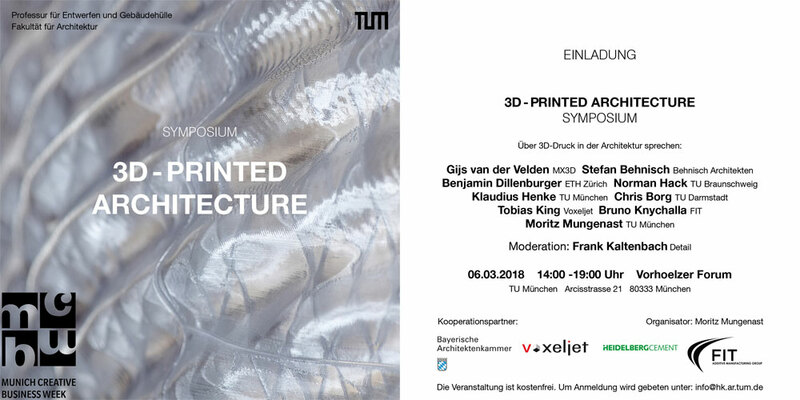 the symposium will take place on 6. March 2018 from 14:00 till 19:00 o’clock in technical university Munich in Vorhoelzer Forum. there will be a variety of speakers from different branches; such as Architecture, industry, and research, and they will speak about the actual stand of the technology and the opportunity of future developments. To the speakers belong the researcher Benjamin Dillenburger (ETH Zürich) project: Digital grotesque , Norman Hack (ETH Zürich/TU Braunschweig) project: Mesh Mould , Chris Borg-Costanzi (TU Darmstadt) project: AM-Blog: AM4AE , Klaudius Henke (TU Munich) project: Light concrete, Moritz Mungenast (TU Munich) project: 3D printed facade. the international well-known architect Stefan Behnisch will discuss the potential applications in all day practice of architects and new construction tasks and challenges. SAVE THE DATE: Tu, 06.03.2018, 14 – 19 o’clock in Vorhoelzer Forum, 5. Floor, TU München, Arcisstraße 21, 80333 München.